The school is part of the Clinton Community School District, and has an enrollment of approximately 1,250 students in grades 9 through 12. Built in 1963, the school was in need of major renovations to the Physical Education Department. In 2010, school officials retained Frevert Ramsey Kobes Architects to complete the renovation. The $7.7 million addition/renovation contains a state-of-the-art natatorium, cardio work-out room, health classroom, training facility, wrestling facility, and a recreational gymnasium. One of the centerpieces of the project is the 6,120 sq. ft. 11 lane 25-yard swimming pool, designed by Counsilman-Hunsaker. 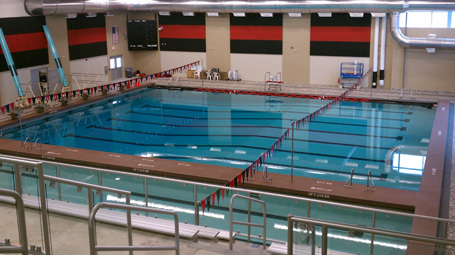 The pool is configured with eight competition lanes with depths ranging from 5 ft. to 13 ft. for the boys’ and girls’ swim teams: River Kings and River Queens. With spectators seated in the natatorium above, the deck below will allow uncongested space for competitors as they prepare to race. A peninsula for officials is set up between the three practice lanes, which will be used for physical education classes and competition warm-ups and cool-downs.